The deep sea oil spill in the Gulf of Mexico is not the problem affecting the millions of people who live on the coast of Louisiana, Alabama, Mississippi and Florida, it is now a global disaster. The U.S. government may have hung the financial cost of plugging the leak and the clean-up around the necks of British Petroleum, but this disaster requires our spiritual and moral intervention. The U.S. government will send troops to invade foreign countries when it perceives a threat to the country’s national security. The irony of the situation in the Gulf of Mexico is that this spill, which is evidently the result of reckless human behavior, requires an even greater intervention. But that’s not likely to happen anytime soon. The undersea well has been leaking now for a month. It is estimated to be 130 miles long and 70 miles wide and threatens hundreds of species in the Gulf, including critical habitat for endangered species, such as sperm whales, dolphins, sharks, bluefin tuna, sea turtles and migratory birds. We know this area is a vital resting spot for more than 70 percent of the waterfowls in the United States. Had something like this happened anywhere in the Middle East the Western media and its array of pundits would have absolutely no hesitation in blaming it on illiteracy and lack of political freedoms in Muslim countries. Challenges that perhaps an invasion or two might remedy. Why is BP allowed to hoodwink and bamboozle its way through this disaster? And now for the last 30 days and counting since BP’s oil rig blew up killing 11 workers, nearly a quarter of a million gallons of oil has been spilling into the Gulf every day. It boggles the imagination that a multi-national corporation that rakes in billions of dollars in profits annually is allowed to lie, deceive and talk its way past what is no less a catastrophe. This is all happening, least we miss the point, while Avatar the hit movie that took ten years to make and that is raking in millions at the box office, celebrates the victory of an indigenous people who fights to preserve what is sacred to them against a formidable enemy. It means that the source of life is water, by God’s will, and that without it all living things will eventually cease to exist. It is for this reason that the preservation and use of water has been dealt with extensively by Muslim jurists. Water, after all, is a cardinal requirement for the ritual act of purification which in turn is a requisite for worship, the essence of man’s function on earth. 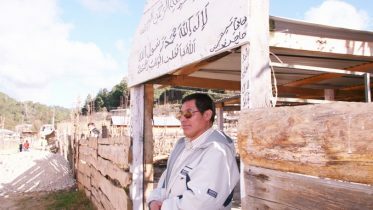 The Romans were admired for introducing water into their cities, but the Muslims distinguished themselves and soon became masters of water use and conservation practices in rural areas. Their contribution to this field profoundly altered the management of cultivated soil and crop cycles. In Andalusia, in what is today Spain, the effective use of water by Muslims altered the agricultural landscape of that region and gave its inhabitants fruits and vegetables they’d never before tasted. The verse describes an intense darkness that blocks out the seven colors that becomes visible to the eyes with the infraction of light. The colors gradually disappear in the depths of the ocean until one gets to a depth of 1000 metres at which point colors are impossible to see and one is engulfed in utter darkness. This verse provides a powerful imagery of what modern science tells us the deep oceans look like. And for what its worth, BP has set up a rare live video feed of this leak that is taking place 5,000 feet or 1,500 meters below the ocean’s surface. And in a final footnote to this week’s commentary is a suggestion from the United States government to set controlled fires in the Gulf to burn the oil. And when the Oceans rise, or, according to the interpretation of Imam Hasan Al-Basri, When the Oceans are engulfed in fire. The word Sujjirat can have two meanings. In everything there resides a sign of Him, Providing proof that He is THE One. ‘Ashiqam bar hama ‘alam ki hama ‘alam azost. I am happy in the world of nature for the world of nature is happy through Him. I am in love with the whole cosmos for the whole cosmos comes from Him. Thank you for tuning in and May God Almighty make us people who neither wastes nor exploits what He has given us as gifts. 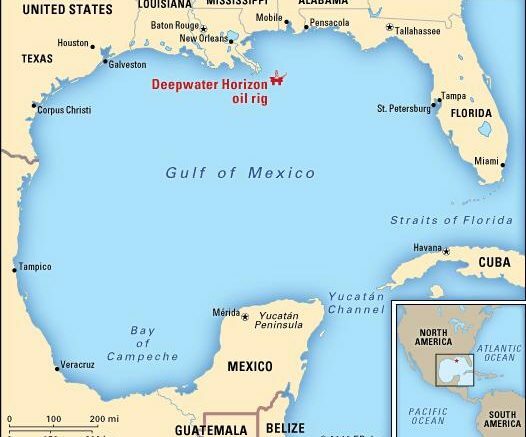 Be the first to comment on "The deep sea oil spill in the Gulf of Mexico"